“With shortening of spring hunting season, lengthening of summer season when they are food-deprived and still experiencing difficulties in gathering food in the winter, polar bears are stressed physiologically," Ben David said. "They have to rely on stored energy gained in spring to survive most of the year. If they don’t get enough food in the spring, the bears begin winter in poorer shape." “This project was logistically so intense that it may never be replicated," said co-author Hank Harlow, an eco-physiologist and colleague of Ben David’s in the University of Wyoming Department of Zoology and Physiology. Earlier work suggested that the bears could somewhat compensate for lack of food in the summer by going into a walking hibernation, slowing their activity and metabolic rate to be similar to what happens to bears in the winter. Ben David said this study proved otherwise. 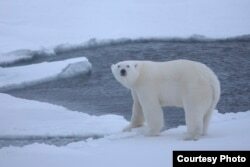 Between 20,000 and 25,000 polar bears live in the Arctic. Ben David said the study adds to the urgent call to protect them. “If we want to be responsible citizens of this planet, we have to do everything in our power to stop, reverse the trend of sea ice loss,” she said. She said nations of the world must rein in the greenhouse gases that are warming the planet, pushing the polar bear to extinction.